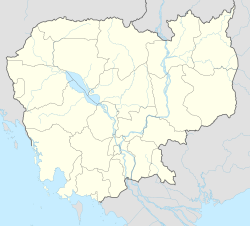 Angkor Borei District (Khmer: ស្រុកអង្គរបុរី) is a district located in Takéo Province, in southern Cambodia. According to the 1998 census of Cambodia, it had a population of 44,980. In this site various archaeological methods were used such as surface survey and mapping, test excavations, auger sampling and coring, and trenching with a backhoe. It is the birthplace of Norodom, King of Cambodia from 1860 to 1904. ^ General Population Census of Cambodia, 1998: Village Gazetteer. National Institute of Statistics. February 2000. pp. 239–240. ^ "General Population Census of Cambodia 1998, Final Census Results" (PDF). National Institute of Statistics, Ministry of Planning, Cambodia. August 2002. Retrieved 2010-11-25. See page 267. ^ John Caverhill, “Some Attempts to ascertain the utmost Extent of the Knowledge of the Ancients in the East Indies”, Philosophical Transactions, vol.57, 1767, pp. 155-174. Rinith Taing, ‘The mysterious ‘foreigners’ carved into the temples of Sambor Prei Kuk’, Phnom Penh Post, 9 June 2017. ^ Miriam T. Stark, et al., “Results of the 1995–1996 Archaeological Field Investigations at Angkor Borei, Cambodia”, Asian Perspectives, vol.38, no.1, 1999, at University of Hawai’i, pp.7-36. ^ Stark, Miriam; Bong Sovath (2001). "Recent Research on emergent complexity in Cambodia's Mekong". Bulletin of the Indo-Pacific Prehistory Association: 85–98. Wikimedia Commons has media related to Angkor Borei. This page was last edited on 8 February 2019, at 04:42 (UTC).